In 1999, General Motors invited me to test drive a bunch of their vehicles on makeshift courses at a Great America parking lot. While spinning the wheels of a C5 Chevrolet Corvette and even the atrociously styled Pontiac Trans Am convertible gave me some smiles, there was another sporty-looking oddity that left me in bewilderment and disgust. I disliked it so much that I didn’t even bother to take a photo of the vehicle and promptly forgot about the experience until nine years later. That is, until I saw an article about how much a recent example sold for: $465,000! 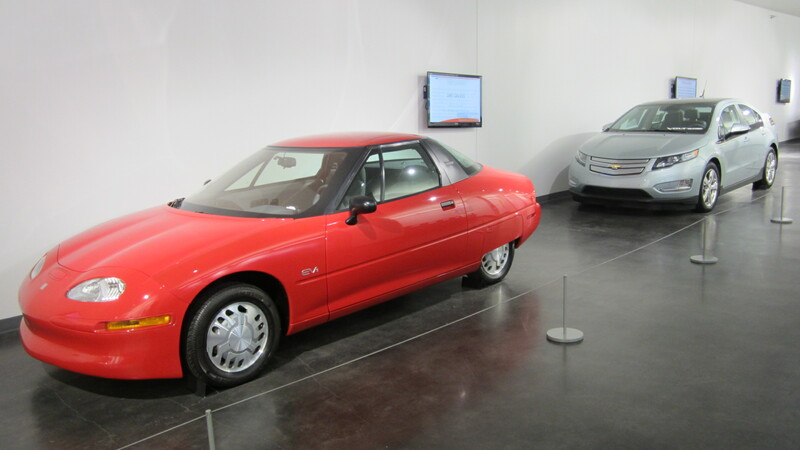 The car was the GM EV1, which was available for lease (but not for sale) from select Saturn dealerships in the late 90s and early 2000s for what a typical $40k car would lease for. This strange-looking (but aerodynamic) abomination looked like it was penned by someone with a sick fascination for isosceles triangles and the styling tastes of Oscar the Grouch. It was covered with so much plastic inside and out that it singlehandedly fulfilled the prognostication afforded to Benjamin Braddock in The Graduate about how the future was in plastics. The interior appeared to be designed for an arcade game at Chuck E. Cheese instead of a cockpit made for driving. November 1, 1999: I drove the EV1 which I was NOT impressed with. Not only is it ugly and super expensive (esp. for something that can’t go much more than 60 miles at a time! ), it sounds just like a golf cart! And driving through the cones was actually scary for me… with the skinny 50-psi tires and plastic steering wheel, there was no positive road feel at all. I had no confidence planting the car anywhere. In addition, it had a maximum range of only 70 miles and its lead-acid batteries were not expected to last much more than a few years. No wonder General Motors promptly built a coffin for the car (so to speak) and buried it as quickly as it could when the California Air and Resources Board changed their zero emissions mandate in the early 2000s, as chronicled in the excellent documentary, Who Killed the Electric Car?. But what a difference a decade makes. Nowadays I am more environmentally conscious than back in the day when I was driving an old British roadster with minimal emissions control equipment and the fuel sippage of a modern SUV, and can better appreciate the EV1 for what it was. Despite the car’s shortcomings, GM beat every other major manufacturer in mass-producing a passably driveable 100% electric vehicle. The car—while sounding terrible—could actually accelerate from 0-60 in 7.9 seconds, which was quicker than several cars I’ve owned. And like a schoolboy who had suddenly realized that the girl next door was actually adorable beneath her glasses and oversized clothing, I will even now concede that the EV1 was kind of cute. Certainly not drop-dead gorgeous, but different and far from boring at the very least. So my appreciation for the EV1 has grown exponentially much like the car’s value, and I can only wonder if the General would be farther away from the brink of bankruptcy today if it had focused more on such vehicles instead of so enthusiastically turning out Hummers. And had ignored naysayers like myself who initially could not see any value in what was actually a ground-breaking car.